Its purpose is to instill in students the values of citizenship, service to the community and to the United States, personal responsibility, and a sense of accomplishment. Students also learn strengths such as integrity, self-confidence, responsibility, and the ethical values of honor, commitment, respect, loyalty, and selfless service. Appreciation of the ethical values and principles that underlie good citizenship which include integrity, responsibility and respect for authority. Leadership potential with the abilities to live and work cooperatively with others. Ability to think logically and to communicate effectively. Importance of physical fitness and good health. Knowledge of the effects and dangers of substance abuse. Abilities of goal setting and positive self-esteem. The history, purpose and structure of the military. Knowledge of educational and vocational opportunities. Importance of a high school education. In meeting these objectives, this student-run program prepares students for life—not for the military. 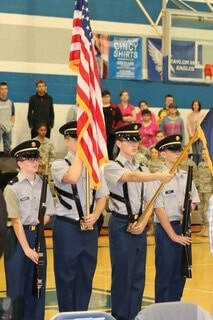 JROTC training gives students the skills needed to succeed in life. In LET I, instruction includes introduction to leadership traits, principles, team building, appreciation of citizenship rights and responsibilities, financial planning for teenagers, improving communication skills, first aid, and sports marksmanship. LET II instruction begins with an in-depth study of leadership styles and values. Second year students demonstrate increased leadership ability through study and practical leadership experience as a non-commissioned officer in the JROTC battalion. They are taught to set sound goals and are closely mentored by the instructors and senior cadets. These new leaders are guided to learn from their mistakes so that they can continually improve on their leadership skills. LET II students have opportunities for the practical application of leadership skills. Effective oral communication skills, map reading, advanced first aid topics, sports marksmanship, and financial planning for teenagers are also taught. LET III students learn principles of management, planning and decision-making processes, leadership and societal ethics, role of the military in American society, and advanced written and oral communication skills. Third year students are now ready to be placed in the even more challenging leadership roles of junior officers in the JROTC battalion. They continue to help train and mentor their subordinates. LET III students have numerous opportunities for the practical development of leadership skills. In LET IV, each student is given a staff leadership position as a senior officer within the Wolf Pack with specific leadership and management responsibilities and project assignments. They demonstrate a high degree of leadership ability through practical applications. These fourth year students demonstrate an understanding of all previous leadership instruction, ethics, problem-solving, organizational and decision-making skills. Teamwork and responsibility are stressed. Students also prepare numerous written requirements and oral presentations. Visit the national JROTC website.